Can Rabbits Eat Globe Artichokes? There are three different plants which are all known as artichokes, which are the Jerusalem artichoke, the Chinese artichoke and the Globe artichoke. However, there is one of them that is considered to be the true artichoke of the three of them, and that is the Globe artichoke. 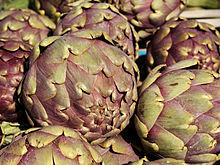 Although they share the same name, the Globe artichoke is not related to any of the other two types of artichoke. The Globe artichoke is closely related to the thistle and has an edible portion which consists of the flower. The budding artichoke flower-head is a cluster of budding flowers which together with many bracts on an edible base. The rest of the artichoke is not edible at all however. So can rabbits eat artichokes at all, and if they can how much of them can be eaten? Lets take a look at their nutritional data to find out more about them. As per usual, we’re interested in their starch, sugar, fat, phosphorous, acidic and calcium content which will reveal if it is any good for rabbits. As you can see Globe artichokes have a lot of phosphorus and are very acidic. This makes them pretty bad for rabbits and a vegetable that they should avoid. If they do happen to eat a little of them, then this wont hurt them but they will not benefit from being purposely fed them. There are much better and healthier foods for them to eat, and Globe artichokes are definately one to avoid for bunnies.